Fresh from the junk-strewn dunes of Jakku! It's Rey's speeder from Star Wars: The Force Awakens! The 6-inch scale vehicle and Rey figure feature movie-true designs and detailing. Quality and realism Star Wars devotees love! Crafted to look like Rey's speeder from Star Wars: The Force Awakens, the Star Wars The Black Series Rey's Speeder Vehicle with Rey Action Figure is exquisitely detailed with true-to-story design and incredible features. 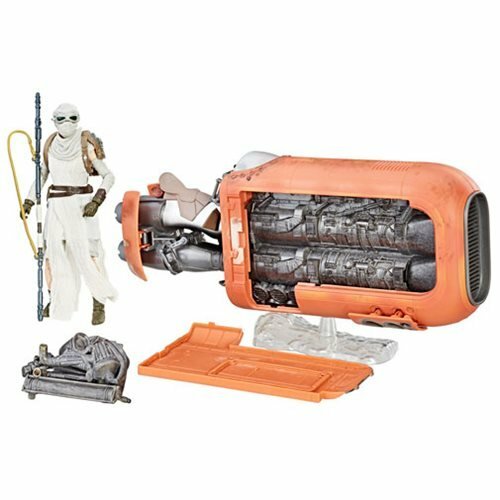 Designed for ultimate collectability and display, the 6-inch scale speeder (Jakku) vehicle and Rey (scavenger) figure feature movie-real detailing. Rey includes a cloth accessory and multiple points of articulation, while her ride comes with a clear stand for display. Collect all the Star Wars The Black Series figures, vehicles, and more (sold separately) to expand and enhance your Star Wars collection! Ages 4 and up. Rey is a resilient survivor, a scavenger toughened by a lifetime of dealing with the cutthroats of the harsh desert world of Jakku. For quick transportation across the junk-strewn dunes of Jakku, Rey relies on her old salvaged speeder. Kids and fans alike can imagine the biggest battles and missions in the Star Wars saga with 6-inch scale vehicles from Star Wars The Black Series. With exquisite features and decoration, this series embodies the quality and realism Star Wars devotees love!